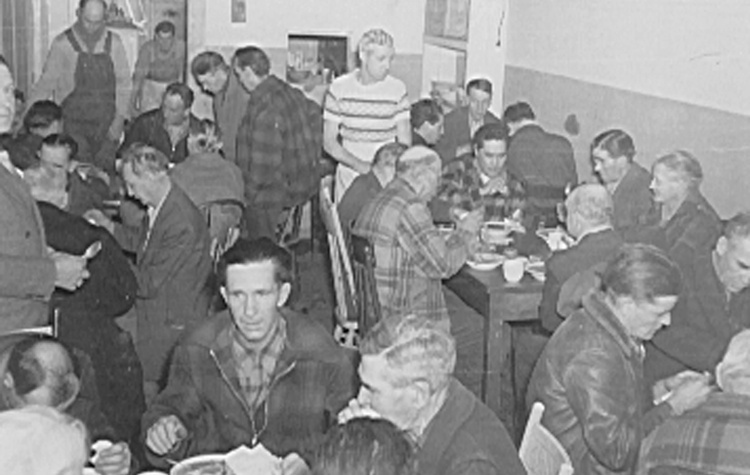 In the autumn of 1951, a group of businessmen from Spokane attended a dinner hosted by Albert Arend, where they heard testimony from a former alcoholic whose life had been changed through hearing the gospel at the Yakima rescue mission. Arend asked who would be willing to serve on the board of a new mission in Spokane to reach homeless men with the gospel. All of them raised their hands. A woman named Bonnie Martin already was running the Pacific Coast Mission, a chapel and soup kitchen on Stevens Street, but was looking to pass the work along to others. The newly incorporated Union Gospel Mission succeeded her. They established a chapel/kitchen in an old speakeasy. Men would come for the service, get a meal (as far as the food would go) and then many would stay and sleep on the floor. “We knew that we had to have better accommodations,” Arend said. A building at Browne and Trent soon became available for purchase at $68,000. The board agreed to buy the building with only $28 in the treasury, believing that God would provide through his people in Spokane. Over the next 66 years and counting, God has fulfilled all of the critical needs at the Union Gospel Mission through people from all different churches and backgrounds. From the start, no government funding has been accepted at UGM, so that the life-saving gospel could be proclaimed without hindrance. The reach of UGM ministries has expanded in astonishing ways that could fill a book (hmmm, there’s an idea...). For this series, however, we’ll summarize a few key developments and people who have been instrumental in making UGM a beacon of the gospel to the broken and hopeless in the Inland Northwest for nearly seven decades. The new Mission building at Browne and Trent was dedicated at a standing-room-only service November 23, where Whitworth College President Frank Warren delivered a stirring sermon. The Women’s Auxiliary was organized by several women, mostly wives of board members, seeking to connect Spokane’s church congregations with the Mission. They soon had dozens of women taking part. 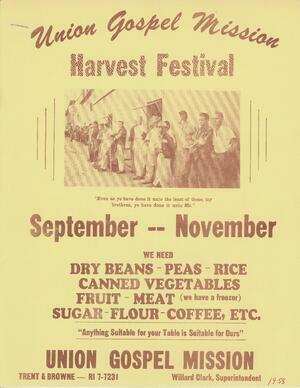 One of their first projects was the “Harvest Festival,” a food collection campaign that evolved to become our annual Fall Food Drive. “So spectacular has been their work that other missions have been encouraged to form similar organizations,” Arend wrote a few years later. 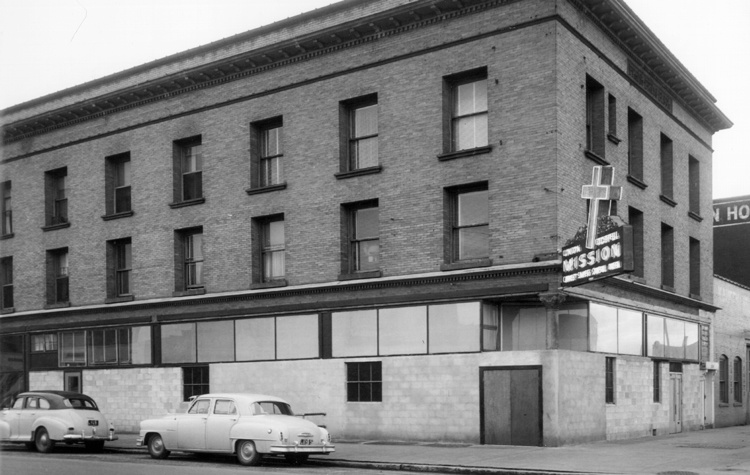 The Mission building underwent extensive remodeling made possible by a generous grant from the Comstock Foundation, which funded several major UGM projects before dissolving around 2000. The city’s need for safe shelter for homeless and battered women and children had become apparent. A former St. Luke’s Hospital building was purchased and remodeled, funded mostly by a charitable trust established by the estate of Anna Ogden. By 1972, a daily average of 15 women and children had found refuge at the new shelter, Anna Ogden Hall. Harry Altmeyer took the reins as executive director of Union Gospel Mission Ministries. He had already served on the UGM board of directors for 20 years and preached in chapel regularly. 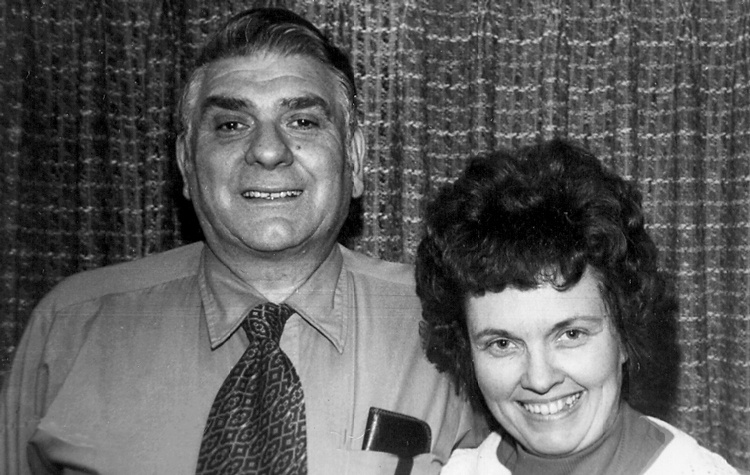 His wife, Earline, who had volunteered with Bonnie Martin in the Pacific Coast Mission where it all started, served with him. Milt Rood launched UGM’s juvenile detention ministry. In the 1980s, it became the special province of Danny Beard and a group of faithful volunteers ministering to young people every week. The ministry continues today as part of UGM Youth Outreach. Eye doctor Walt Michaelis and his assistant Mary Cooper started a free vision clinic, a relatively unique feature among rescue missions. Dr. Dexter Amend would later open a medical clinic at UGM in 1992. Volunteer doctors, nurses and other providers provide free care and referrals for people who can’t afford health care or need help navigating the options available. Randy Altmeyer joined the Mission staff. Randy went on to serve 30 years working with homeless men and affirming their God-given value and dignity. His wife, Shelley, also became a regular bright light in the shelter, sharing the gospel and giving the gift of listening to innumerable residents over the years. 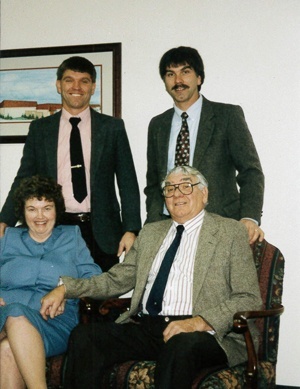 Phil Altmeyer joined the Mission staff as a trainee to succeed his father as executive director. Phil and his wife, Caryl, came from working in Campus Crusade leadership. Harry Altmeyer retired and passed the baton to Phil. Over the next 31 (and counting) years, under Phil’s leadership UGM’s ministries have expanded steadily into more comprehensive services to equip more people to exit homelessness. Click here for Part 2 of UGM’s history! 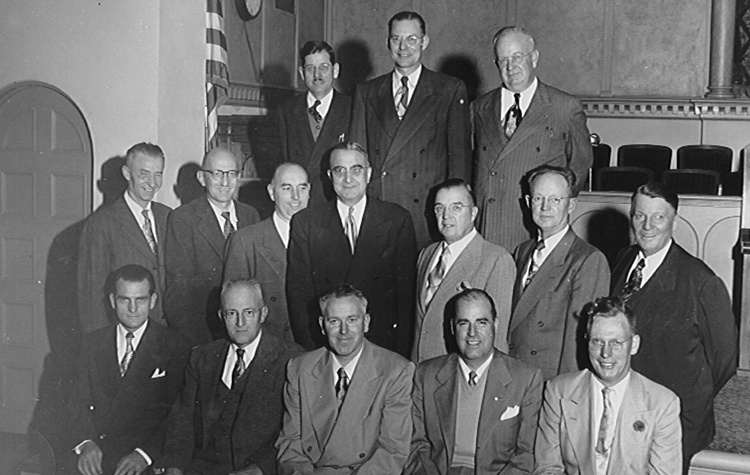 Sharing our history is part of our effort to be transparent and help you make an informed choice when you choose to donate your heard-earned resources to a good cause. Here are a few more tips on things to look for!